Since Ubuntu 11.04 released many people feels their battery life getting shorter than previous, This problem might be caused by difference kernel used and ofcourse a`luxury` display and some desktop effect make GPU should work more hard. We think it's possible to extend a battery life of a laptop/notebook/netbook by disabling various services and installing various packages. Here is tips to extend your battery life summarized from askubuntu.com. Turn off WiFi and Bluetooth. Disable wifi an bluetooth when you do not use it, disabling wifi eill extend your battery life. Reduce desktop effects (System->Preferences->Appearance->Visual Effects->None). even its has been has stated that enabling or disabling desktop effects generally has no impact on battery consumption (codon.org.uk/~mjg59/power/good_practices.html), we think that to much desktop effect will disturb your work and GPU will need more power consumption. Use Hibernate rather than suspend power features. (System->Preferences->Power Management->On Battery Power). Turning off a bunch of services that you don't need, and unloading their kernel drivers. See how to do it here. Use powertop to find which unneeded programs that running on background such as beagle/tracker, weather notifications, gnome-do, and (if you don't need the internet) network-manager, mail-notifications. powertop is Linux tool that finds the software component(s) that make your laptop use more power than necessary while it is idle. Install the package laptop-mode-tools. laptop-mode-tools lets us spin down a hard drive. In addition it allows us to tweak a number of other power-related settings using a simple configuration file. See it here. Install Jupiter, Jupiter applet give quick access to some of the commonly needed hardware controls like screen output and resolution, WIFI, and bluetooth. 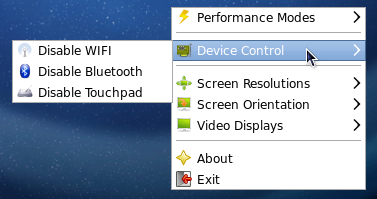 If you use Linux in a netbook/laptop/notebook, it's take the effort out of going mobile. See it here. here are a tips to Increase / Extend a netbook/laptop/notebook battery life, hopefully that next release (ubuntu 11.10) will care about power consumption.